Through the scheme, the Karnataka government aims to foster partnerships with potential service providers and cab aggregators to provide opportunities to unemployed SC/ST youth to take up ownership of cabs and taxis. T he Government of Karnataka recently launched the ‘Airavata Scheme’, a first-of-its-kind scheme that will create more self-employment opportunities and boost livelihood options for rural and semi-urban youth. Targeted especially at the young men and women of SC/ST communities, the scheme will provide training, mentoring, financial assistance and industry partnerships. Overall, the government is looking to invest over Rs. 225 crore in the scheme, which will ensure job creation and economic development. Karnataka Deputy Chief Minister and Bengaluru Development Minister Dr. G Parameshwara noted that these are the kind of schemes that would ensure job creation and boost economic development. “This is a bold step, and a first-of-its-kind programme. There cannot be development without job creation and I hope this Airavata acts as a catalyst in Karnataka’s growth story, and I hope more partners like Uber join us as we take development to every part of the state,” Dr Parameshwara said. Through the Airavata scheme, the Karnataka government aims to foster partnerships with potential service providers and cab aggregators to provide opportunities to unemployed SC/ST youth to take up ownership of cabs and taxis. In the first phase, the department has signed a memorandum of understanding with aggregator Uber under which the government will provide a financial grant of Rs 5 lakh each to identified beneficiaries from the SC/ST community. 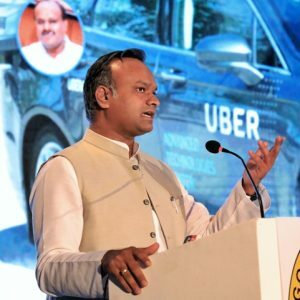 Uber will be assisting the Karnataka Government in identifying eligible candidates from the SC/ST community from Bengaluru, Mysuru, Mangaluru and Hubballi cities in Karnataka, especially in semi-urban areas, and encourage them to take advantage of this scheme. Uber will also train beneficiaries, encourage them to register as Driver Partners on the Uber App, and thereby, provide access to entrepreneurial opportunities and viable earnings. Beneficiaries will also be provided with the necessary assistance to avail any additional loans from financial institutions. Social Welfare Minister Priyank Kharge, under whose department the scheme will be implemented, expressed hope that more and more youth from the marginalised and vulnerable communities come forward and make use of the opportunity, and thus be a part of the technological and industrial revolution in the state. “We, in the government of Karnataka, are committed to people-oriented development. We are committed to provide the SC/ST community with the necessary resources to chart their success stories. With Uber, we will ensure that economic opportunities and income levels in the Tier II and Tier III cities, improves. This will, we hope, improve the standard of living for these families and the communities themselves. We will take every effort to realise the potential and ambitions of our young people, and ensure that Karnataka is truly a state of growth,” the minister said. Interested candidates can apply by downloading the application forms from www.kalyanakendra.com and www.adcl.karnataka.gov.in. These forms will be available on the site from October 2 to October 31, 2018. Swachh Bharat: Delayed but determined?